Road Safety Week is coordinated annually by Brake and involves hundreds of schools, organisations and communities each year. Brake is a road safety charity that works to prevent road death and injury, make streets and communities safer, and supports the victims of road crashes. 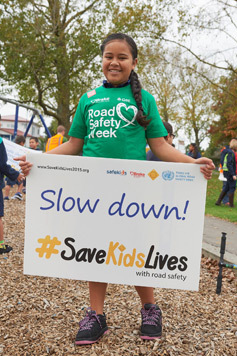 Brake started Road Safety Week in New Zealand in 2012 as an annual event to raise awareness about road safety and promote steps that everyone can take to stop these needless deaths and injuries year-round. Brake has also coordinated Road Safety Week in the UK since 1997. Road Safety Week aims to inspire communities to take action on road safety and promote life-saving messages during the Week and beyond. It also provides a focal point for professionals working in road safety to boost awareness and engagement in their work. All sorts of people get involved - kindys, schools, youth clubs, community campaigners, employers, sports clubs, fire officers, local councils, paramedics, driving instructors... you name it! Your involvement could be as simple as making the Brake Pledge and promoting it in your school/organisation's newsletter and putting up the posters from your action pack. Or you could make a bigger splash by teaming up with others in your area to launch a local campaign or run an event or roadshow promoting safer road use. You could also use the Week to support Brake's work, while also raising awareness of the road safety cause, by fundraising or making a donation. Everyone who registers to take part will receive our downloadable action pack, containing guidance and resources to help you run your event. But Road Safety Week is your week, so what you do is your choice! We are always impressed at the creative ideas communities come up with to get life-saving messages across. Each year we choose a theme to focus our media campaign on: read about this year's theme here. You can focus your activities during the Week on our main theme or any other road safety issue that's important in your area. Road Safety Week is kindly funded by commercial sponsors and supported by a number of agencies and organisations (see our supporters). Thank you! Find out more about Brake's work at www.brake.org.nz and register now to be part of Road Safety Week.